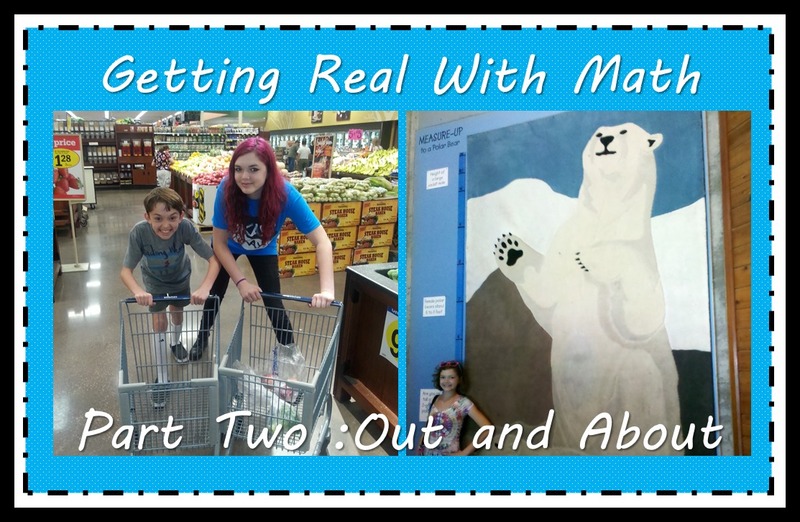 Yesterday I wrote about making math real for children at home. Connecting Math to everyday life helps children be successful in school by showing them Math is important, building vocabulary and math fluency, and promoting critical thinking and problem solving skills. If you missed yesterday’s post: Getting Real With Math – Part 1 of 2 (@ home) click here to check it out. Today I am going to add onto yesterday by pointing out ways to make Math connections outside of the house. Just like yesterday, I would suggest that you keep it real by discussing problems with your child, give them time to think, reflect, talk it out and try to come up with solutions in a way that is natural and does not feel forced or too much like a “lesson”. The grocery store is a great place to use math. Weighing produce, counting soup cans, and comparing prices of cereals are ways to use math skills and expose younger children to math and numbers. As your children get older you can increase the difficulty of your math conversations. My kids and I used to make a game out of estimating our total as we grocery shopped. This helped with rounding and mental math. When we got to the checkout we would see who was closest to the actual total. We haven’t actually played the estimating game lately, but they are older now and really good at comparing prices and figuring out an estimate for a total when we are shopping (especially when they are spending their own money). If these apples are $1 per pound, how much would 3 pounds cost? How did you figure that out? These potatoes are $4 for a 5 pound bag. How much is the cost per pound? If I use this coupon, what is my final price going to be? Which package is a better deal? How can you tell? How many packages do we need to buy to make sure we have enough toilet paper for the week? Comparing a value meal to buying items a la carte at fast food places. Finding total cost of an outing to a water park or movie. Elapsed time: keep track of start and end time and figure out time spent somewhere. Calculating distance traveled on a trip (out of town or just running an errand). Shopping for clothing, toys, books, etc. I hope you enjoyed my post. Please feel free to leave comments with more ideas for using math out and about.